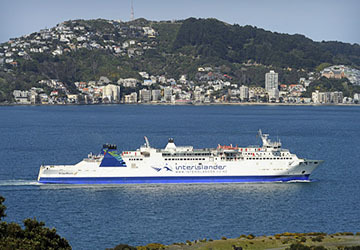 The Aratere is the longest serving ship in the Interislander fleet but is still one of the most modern and high tech vessels on New Zealand waters. It can carry up to 600 passengers and with it being 183.5 metres in length you will not be short of space to roam. Onboard you’ll find a food court, luxury premium seating, children’s playing and changing facilities, a cinema room and even free WiFi, so you won’t have to miss out on work or keeping in touch with family and friends. The lounge bar is the perfect way to relax and is stocked with a large selection of world famous New Zealand wine. There are no cabins on this Interislander ship, however, there is enough comfortable seating aboard the Aratere for everyone to sit back and relax, even during the busy Christmas and Easter periods. 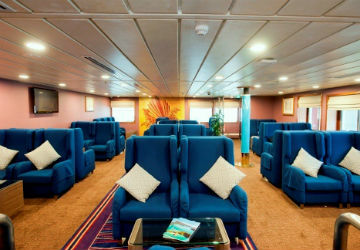 For those who want some privacy during their crossing there is the luxurious Premium Plus Lounges on offer. Premium travellers get to experience the Aratere Plus Seating, as well as three complimentary meals. 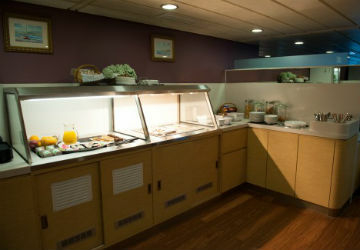 If you fancy a bite to eat on your journey through New Zealand waters then you can visit the onboard Food Court. A large array of dishes are available to suit even the most discerning tastes. 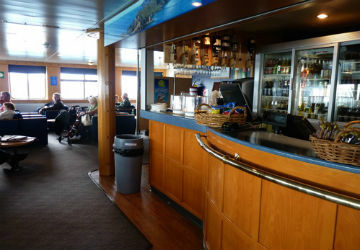 There are two eating areas on Deck 4, the Pennant Café and the F’oc’sle Lounge Bar. 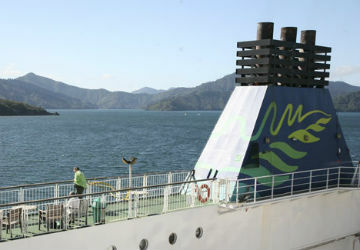 Here you can sample of a range of hot and cold food, including the Interislander’s specially designed pie. For those who fancy sampling some of the local specialities, the bar is stocked with an impressive selection of famous New Zealand wines. 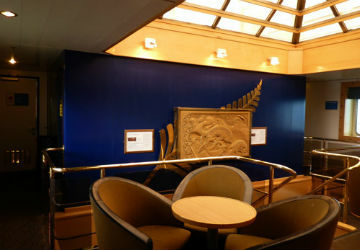 The shop on the ship offers the chance to buy your New Zealand souvenirs as well as travel items, newspapers, confectionery, gifts, puzzles, toys, postcards and stamps. You can also purchase tickets for the cinema room here too. There are a number of additions that will help you while away the hours. The cinema room shows the latest movie releases with showings suitable for all ages. Local bands and performers are often used onboard, including magicians and clowns for younger passengers. A Bureau de Change is available for any passengers who need to exchange some last minute currency. Onboard the ship there is plenty to keep some of the younger passengers occupied. On Deck 4 you can find the Children’s Play Area, a safe and fun environment for little ones to play games, use the slides and pass time in front of the Disney Playhouse Channel that’s displayed on the televisions. There are also two conveniently placed nursery rooms in close proximity to the play area which provide baby changing facilities. The cinema room also shows films to suit all generations. 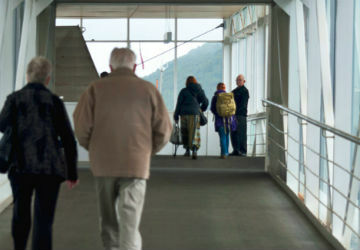 The facilities aboard the Aratere are located on one long and wide deck, meaning that accessibility around the ship is suitable for disabled access. This includes all amenities and the viewing area at the front. This vessel has been accredited with Silver Status on the Be Accessible website. Please Note: Whilst we have taken great care in making our Aratere guide as accurate as possible, onboard facilities, services and entertainment may vary depending on the date and time of year that you travel, facilities mentioned may change without notification and ferry companies reserve the right to operate vessels other than those mentioned at time of booking without prior notification.